In 1854, Louis Vuitton was founded in Paris. 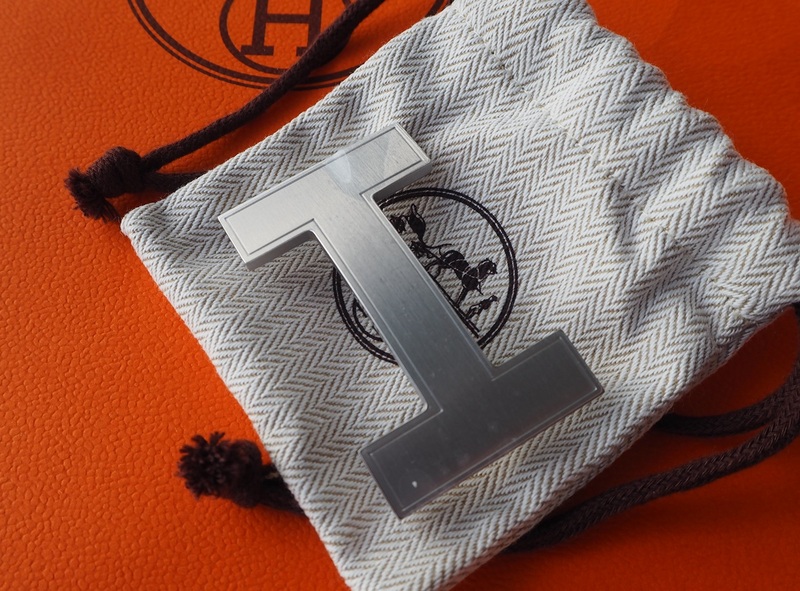 Thanks in large part to its popular LV monogram, it eventually became the world’s most valuable luxury brand, with more than 460 stores worldwide and some $9.4 billion in revenue as of 2013. 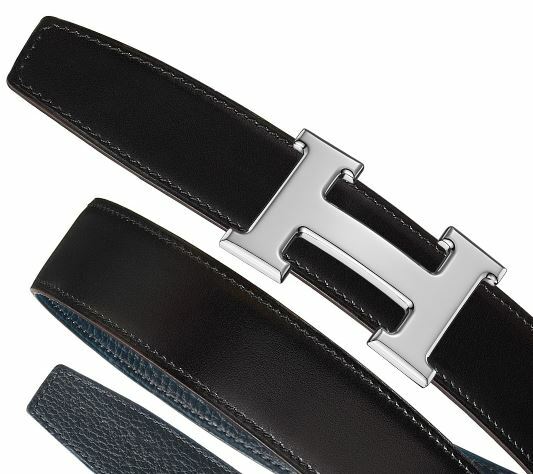 But just one year before Vuitton was established, another French luxury brand quietly came to life. Since Goyard’s inception some 165 years ago, the trunk (and bag-maker) has maintained a mysterious and impressive reputation based on quality and prestige. With zero advertising, no e-commerce, and only a few retail shops worldwide), they’ve managed to protect their legacy while also building a buzz, simultaneously keeping their mouths shut—and everyone else out. The Goyard brand is about legacy, heritage, and functionality. It’s an insider’s bag, but it doesn’t scream luxury. Goyard is very focused artisanal craftsmanship in the category, which explains why there’s such a limited supply of merchandise. When you buy a Goyard, you know that you are not buying into a mass produced luxury item. 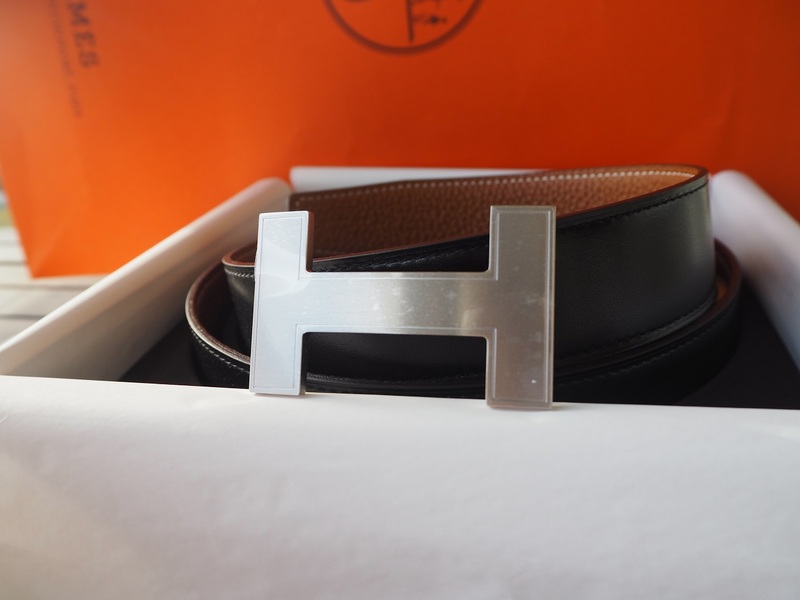 And being limited means there is always a demand for them, even in the resale market where you have it is commonly traded above retail value. 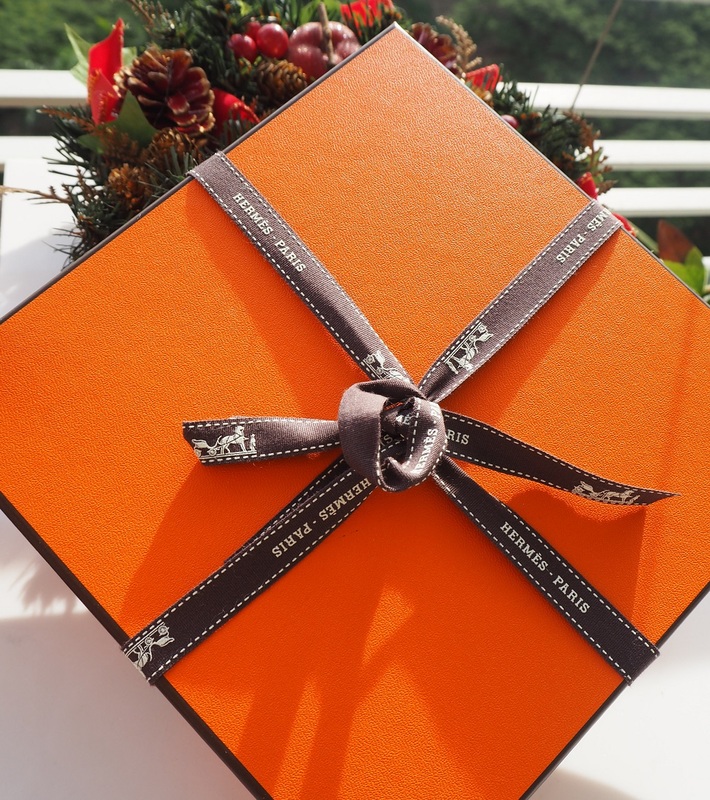 Goyard holds its traditional craft-oriented roots that truly has a limited supply because that’s what their commitment is about. Carrying those leather bag that feels like a workout everytime you take them out? Goyard is all about functionality – A Goyard bag is easy, light, spacious and well-made. 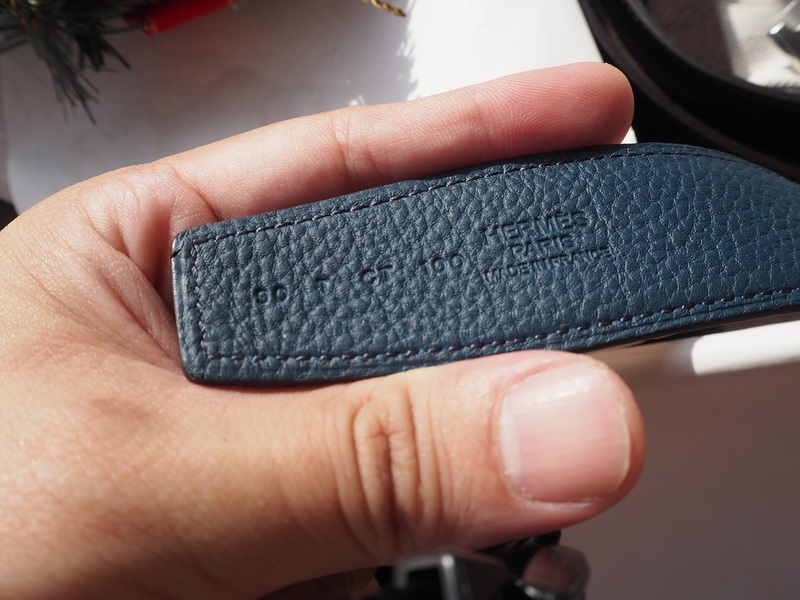 The material cannot be damaged easily, so chances are that it should be easy for you to look at your bag several years from the point you bought it and recognise that it’s the same bag. The bags are also waterproof, so you don’t have to check the weather first to make sure whether or not to take them outside with you. 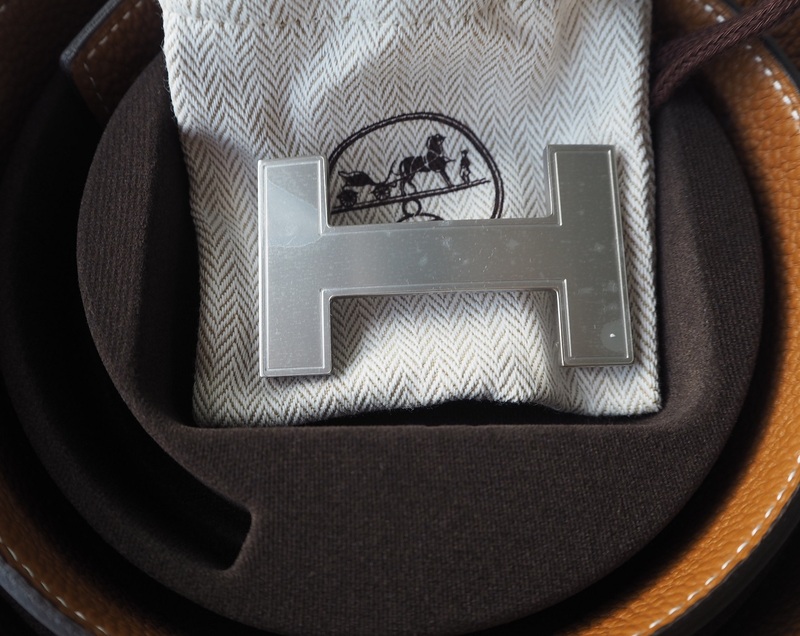 Remember what you carrying will be a reflection of you, so happy shopping! Do you know a baguette cannot be eaten and messenger is not a person who delivers message? Or a hobo is not homeless vagabond? This guide is a beginner's guide to the bags! 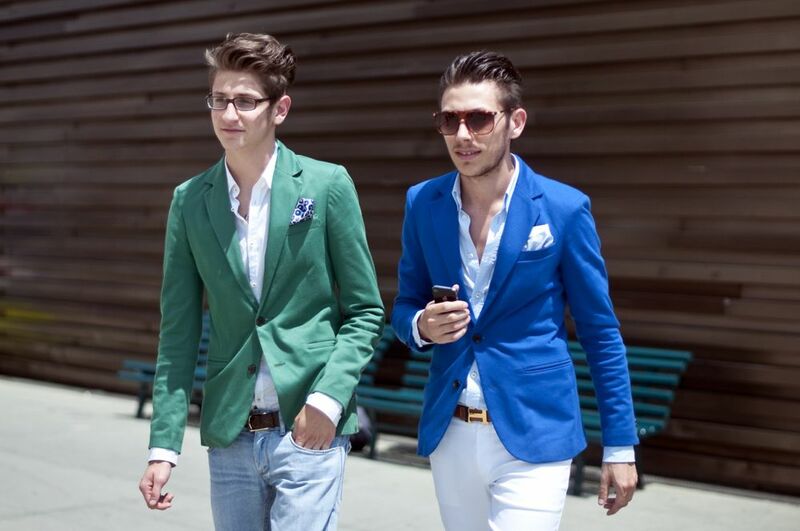 Now you can go impress your girlfriends/wife/friends! 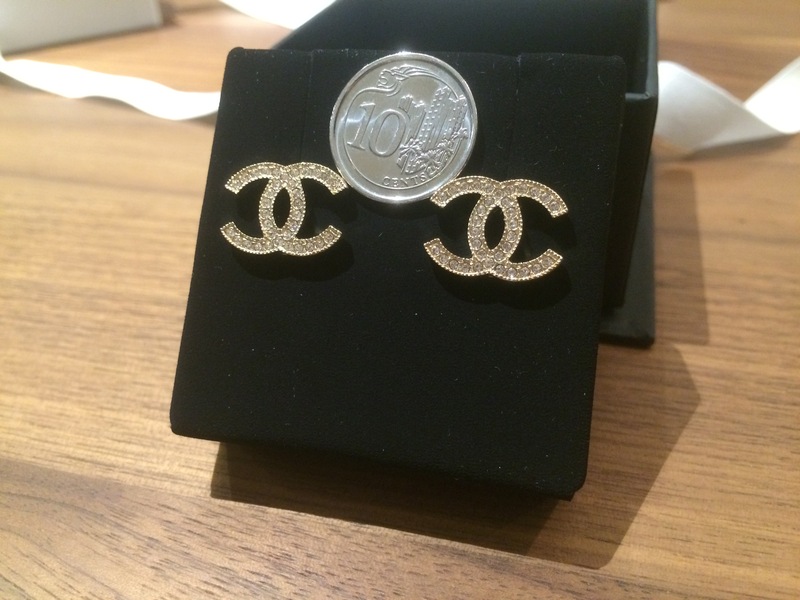 Did you ever wonder why is there always a white flower found in all Chanel’s packaging and some of the designs? Contrary to popular belief, the white flower is not a rose or anything vaguely related to the family of rose. The white flower is actually the Camellia flower, a member of the Theaceae (tea) family. Camellia’s flower was a garden treasure in China long before the flower was introduced to Western civilization. It is actually originated in southern and eastern Asia and brought to Europe in the 18th Century. Camellias are known as "tea flower", or 茶花 in Chinese. The flower itself is one of the few that will open in the cold of winter months and comes in equally rich yet delicate colors ranging from deep reds to pinks to the purest of whites. 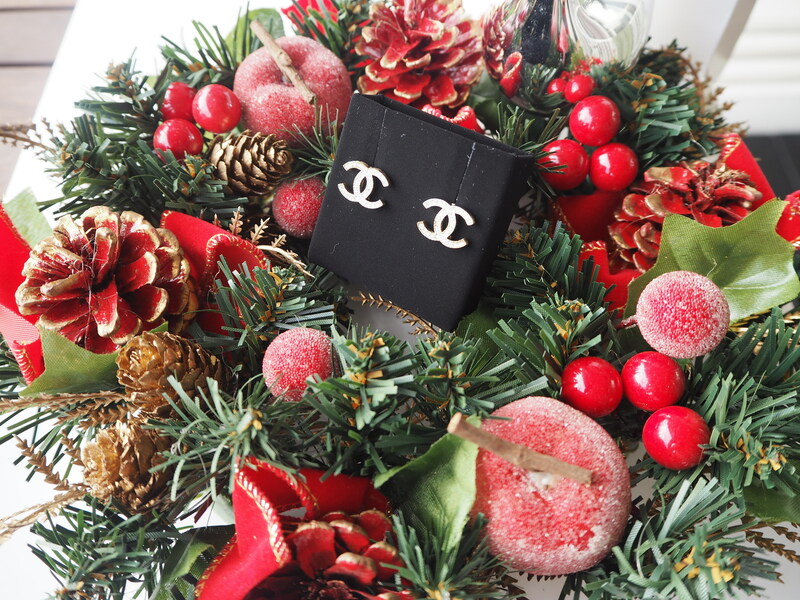 Story goes was that Coco Chanel received a bouquet of Camellias from the love of her life, Boy Capel, back in 1912. Needless to say she was already besotted with Capel but she was also infatuated with the flower he introduced her to & which came to represent their love. 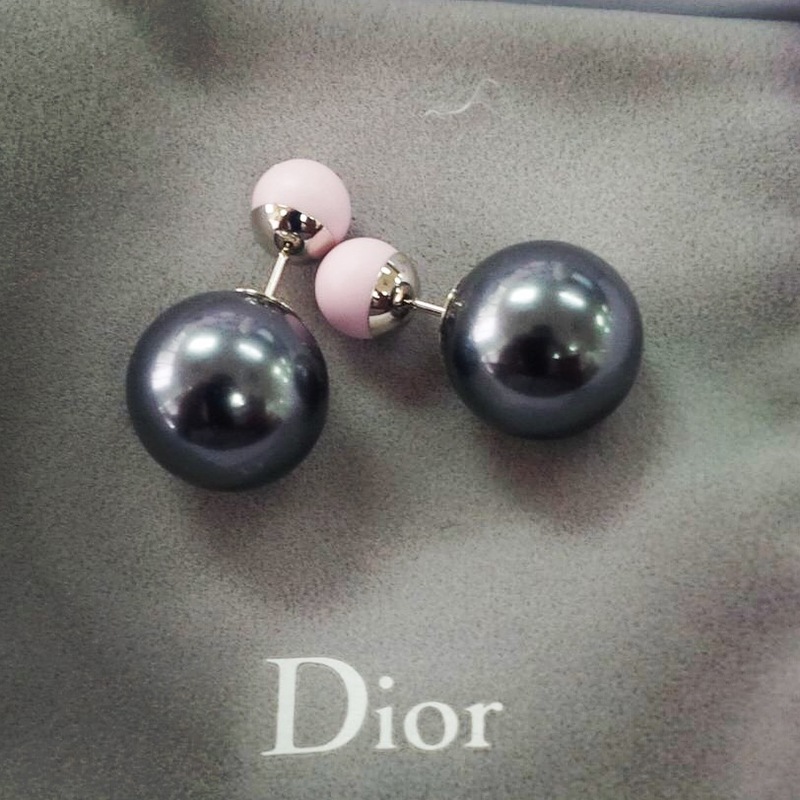 The blossom not only symbolized purity & implied a sort of fragility, its elegant roundness with visible perfection in its geometrical petals give the flower an effortless allure & simple beauty. Camellia appealed to Chanel’s taste of provocation due to its reference as the forbidden flower, both androgynous and ambiguous. 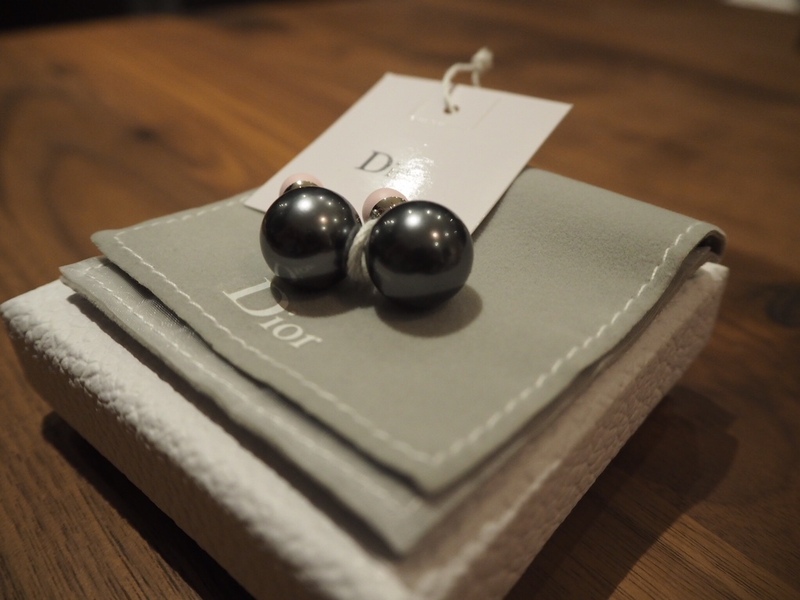 Coco Chanel started pinning silk versions to her lapels, her hair and the blossoms found a home on the black-and-gold-laquered Coromandel screens in her apartment at 31 Rue Cambon. 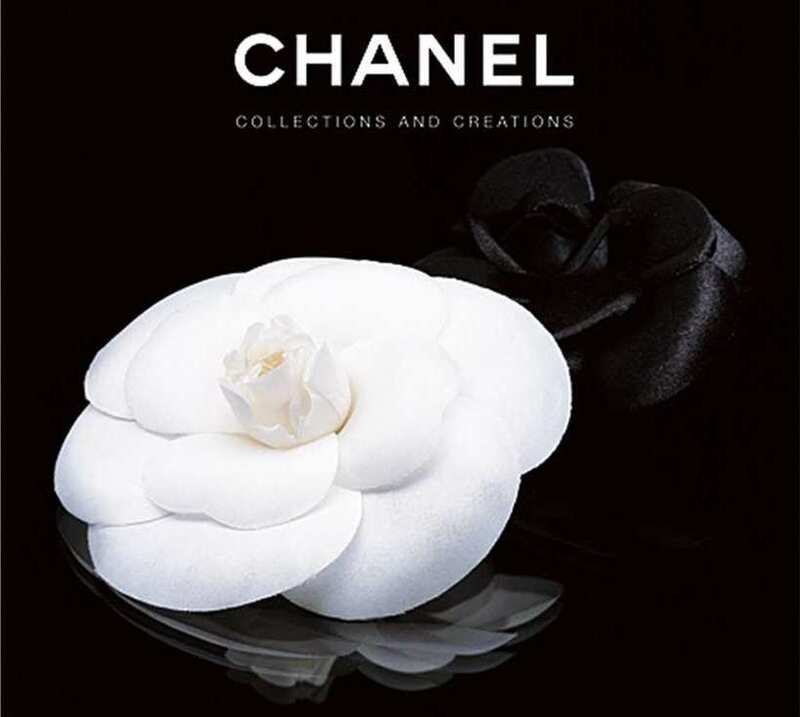 Soon after, Camellia became Coco’s symbol, her icon, one of her most celebrated inspirations and have continued to live on as the second most recognize Chanel icon (apart from the official Chanel logo). In Asia, Camellia represents purity and longevity and in Japan its name means “excellence without pretension”. The Camellia is the plant from which Earl Grey and other popular teas are made. 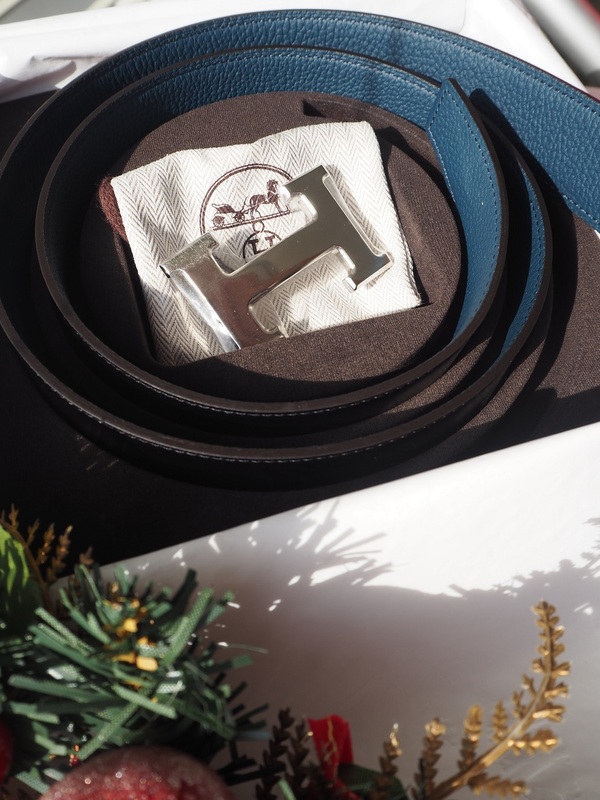 Hermes 32mm men’s leather strap in chocolate box calfskin/indigo blue togo calfskin (strap width:1.25′) & 5382 H-buckle, silver and palladium plated. 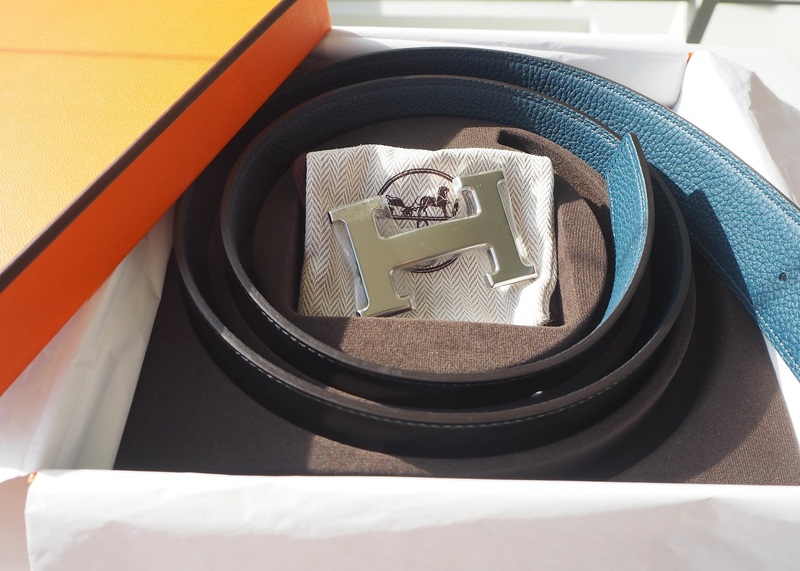 5382 H-buckle (Silver shine) + two tone (black/indigo blue togo) leather belt for sale. The size is 90cm (approximately 32 -34 inches at the middle hole). 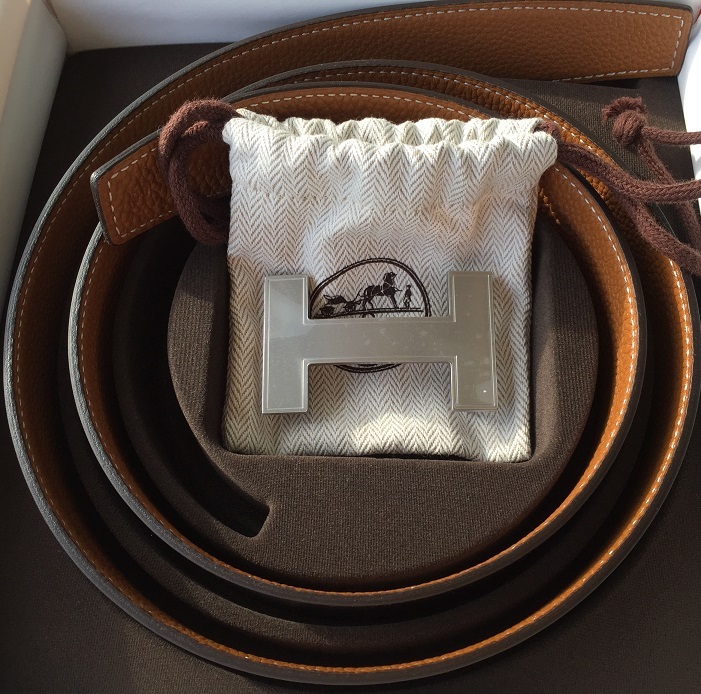 It will cost you S$1,300 at the local Hermes shop and it is usually out of stock, with long waiting list to boot. 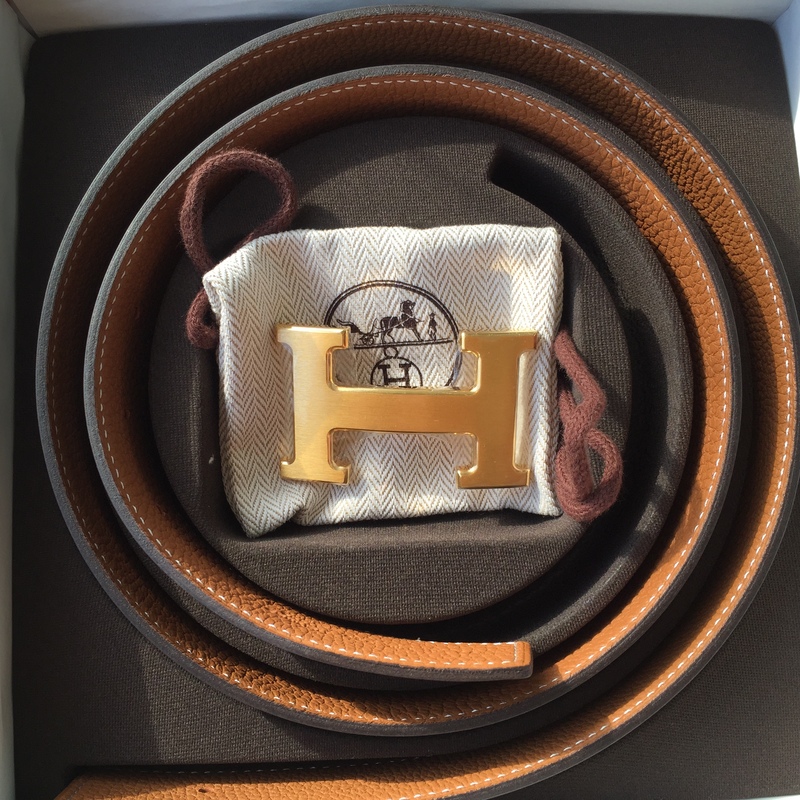 Get it from us for just S$1,050 . 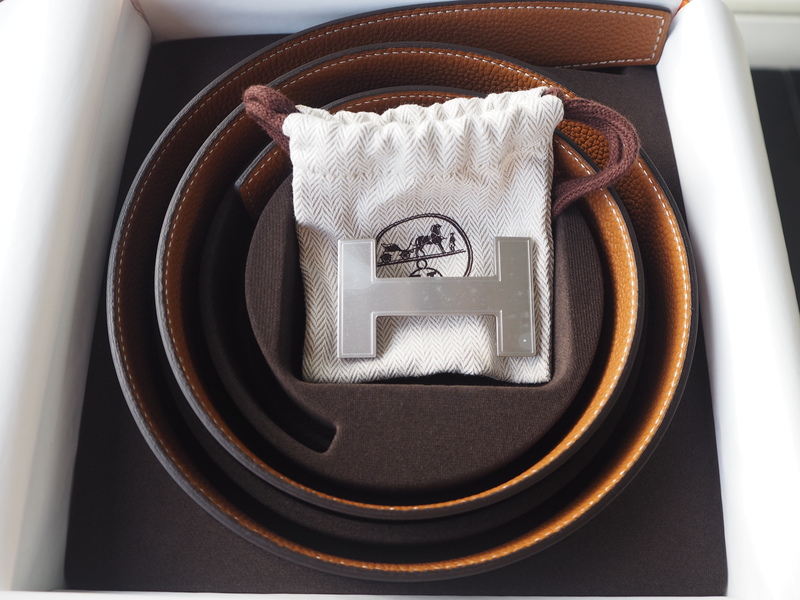 BrandedSG is proud to bring you another popular “H buckle” Hermes belt! 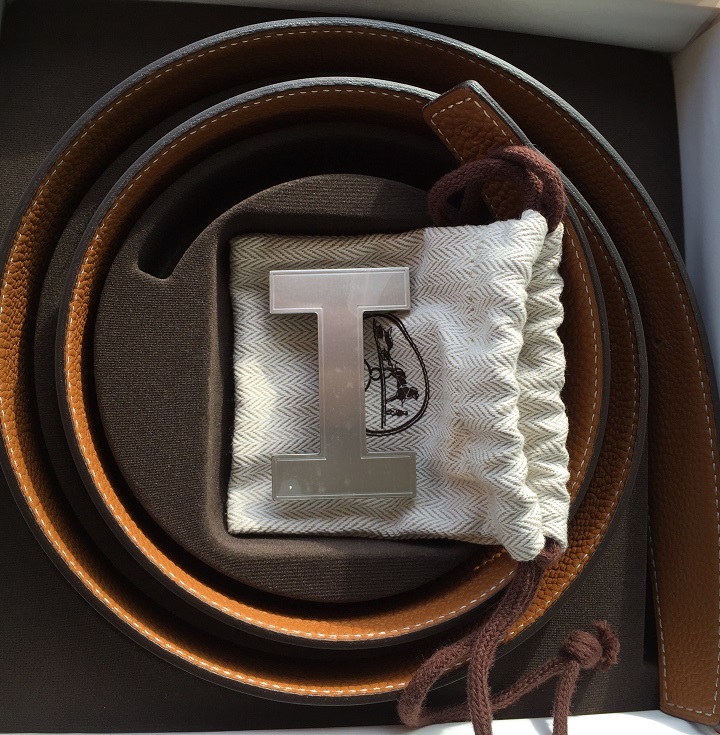 This kit comes with a gold buckle and a black/brown belt. 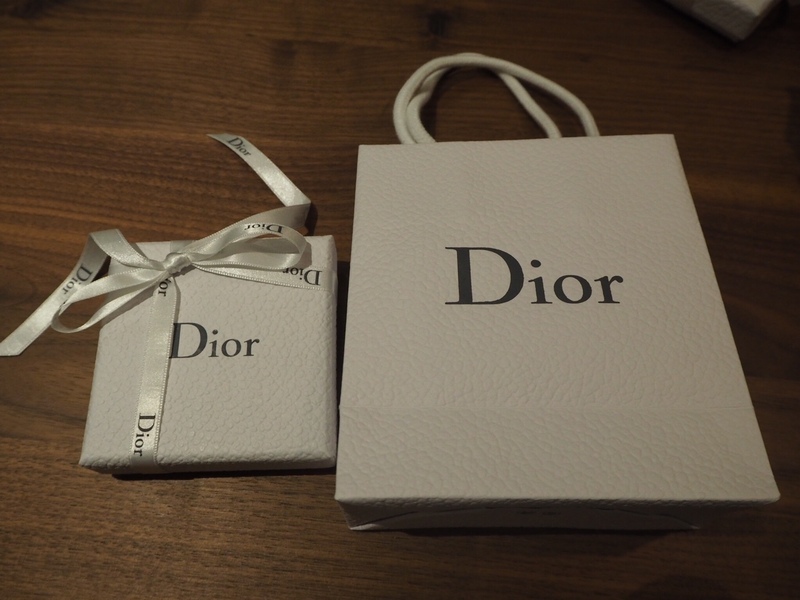 Of course, you’ll also get the full, original packaging; the cloth bag, box, paper bag and even the ribbon. 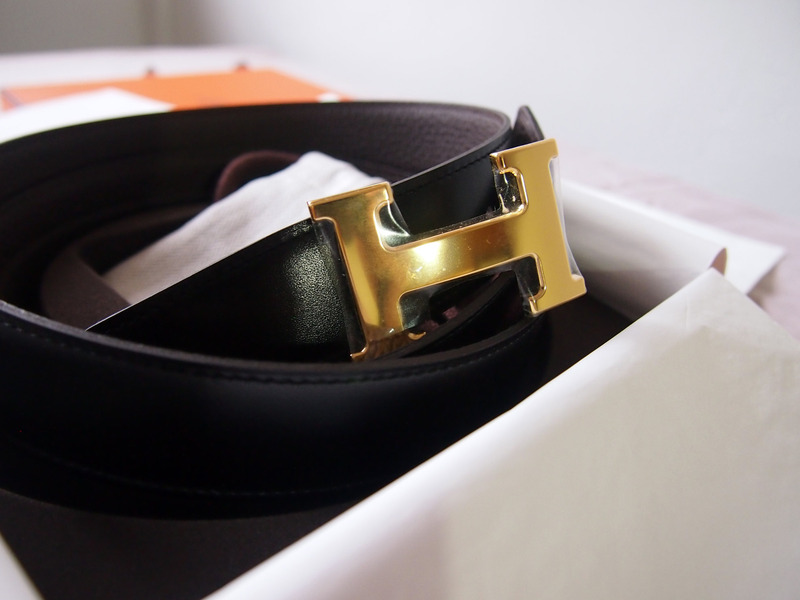 Belt colour: Hermes textured (Toga) brown and black – Please refer to photos for the exact colour tone. 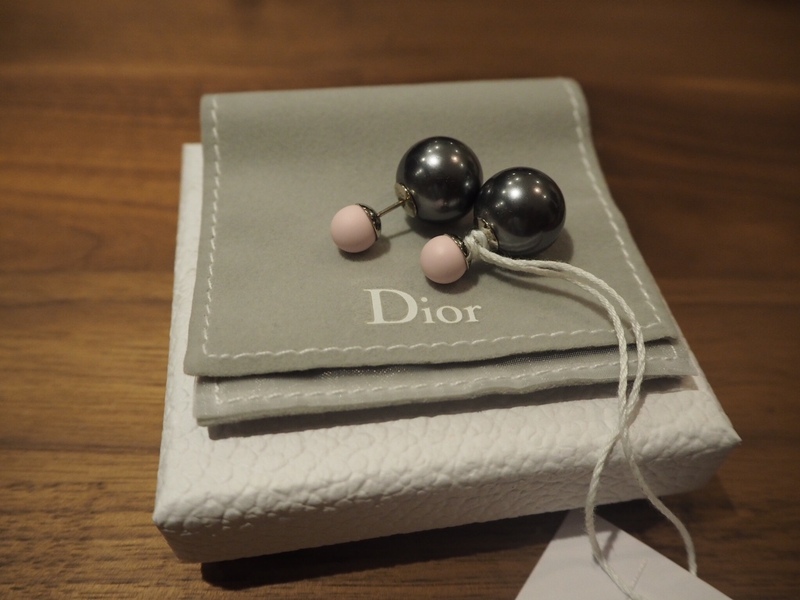 The beauty of these earrings is quite simply, its simplicity. 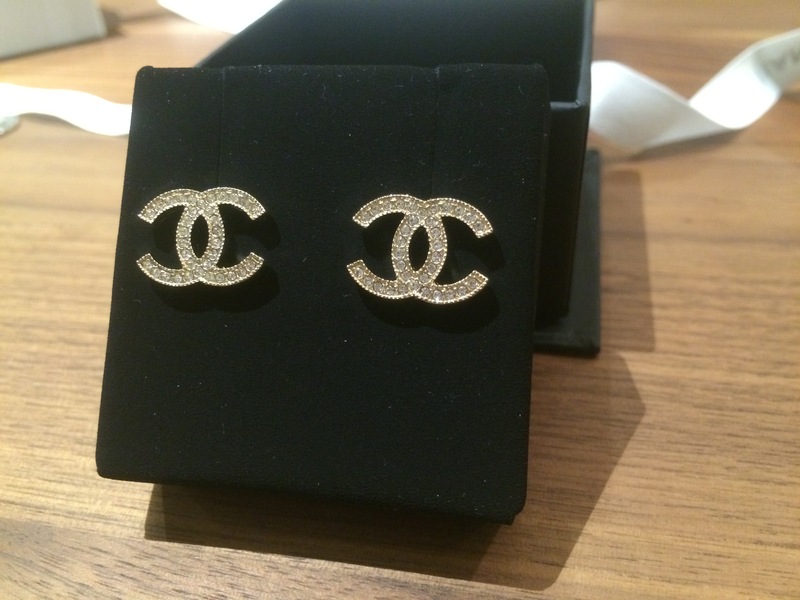 The design of these gold Chanel earrings is a variation of the classic Chanel earring, and they are just as beautifully crafted! 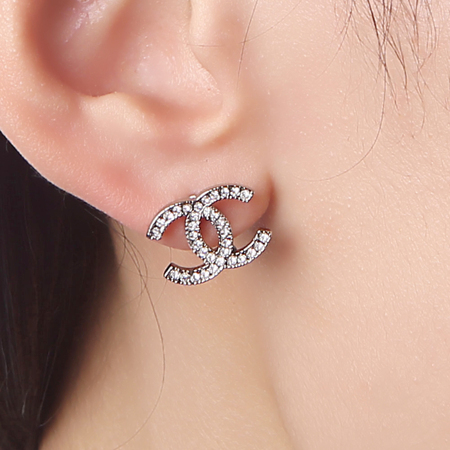 Up your glam factor with this elegant accessory. We have a brand new set, in the original packaging, for sale. Book yours now! 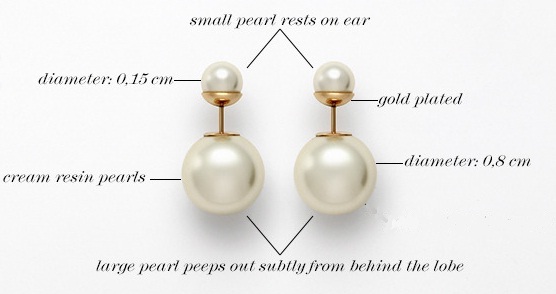 The gold gives these earrings a classy, sophisticated verve.